Stamp This! : Have A Great Day! 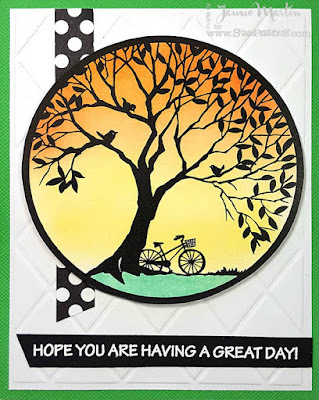 It's Circle Time over at Stampendous and the Design Team will be sharing projects made with the Tree Circle stamp that I've used today and the Wisteria Circle that I shared during Sneak Peek Week, you can see it HERE. Stamp Tree Circle on white cardstock with black ink. Color the grass with green pencils then sponge with yellow and orange inks, being sure not to sponge over the green area. Cut out, layer onto a larger black circle and set aside. Dry emboss a white panel with the Diamond Grid Metal Stencil, add a decorative paper strip down the side and glue to a green card. Pop up Tree Circle on the card. Stamp sentiment from the Big Words Thanks Perfectly Clear Set on a black strip of paper with VersaMark Ink and emboss with white. Glue to the bottom of the card. Be sure to stop by the Stampendous Blog to see what the other Design Team Members have shared this week! Very pretty. I wouldn't have thought to sponge the background. Thanks for the tip. Love your background with the tree silhouette. This place is so special! Speaking of special, this is how our evening went. I met my buddies in the downstairs part of venues in Chicago, which is more than just an average kind of bar with a lot of woodwork. Your beautiful sponged background is ideal for this wonderful circle stamp. Very nice. Amazing colors on this gorgeous card! Love this beautiful scene! Awesome circle stamp! I love this gorgeous stamp. Great card! Great colors and I like the embossed background. Lovely card.. Such a lovely day to be out riding..
Gorgeous card - love this stamp.